What do you perceive as the traditional landscape of tea production? Home › The Tea Crane Blog › What do you perceive as the traditional landscape of tea production? As an exercise, please take in mind that heavy machinery only became employed some 50+ years ago, but that the production of tea has already been part of Japan’s agriculture for centuries. Now, I would like you to use your imagination. What does a traditional tea farm look like? Try to draw a picture of this in your mind. What did you see? Do you picture long lanes of bushes, spread out widely on the planes of Shizuoka? Or did you see rows of bushes, stacked one above the other on the hills and mountains around Kyoto? 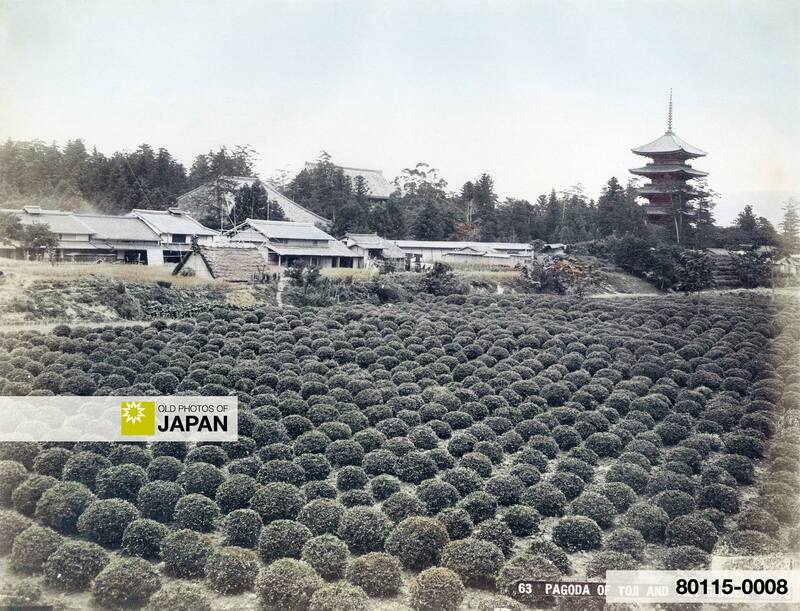 These images are indeed what is referred to, and promoted as the ‘traditional’ landscape of Japanese tea production. Now I invite you to take a look at the following image of a 19th Century traditional tea garden in Kyoto in the vicinity of Tōji temple. Feel free to let me know what you saw or felt in the comments. Wow! What did you just see? Now what do you believe is the shape of a genuinely traditional tea garden? Since the advent of machinery, the landscape of tea production has drastically changed. And with the eye on mass production, a lot of tradition has in actuality not only been eliminated and covered up; it has also been replaced by new depictions of what this tradition is. While in the past, machines were not available to tea farmers, harvesting had to be conducted exclusively by hand, and this was no doubt a tremendously labor intensive activity. Because a tea bush is actually an individual tree – and I am certain that many of you hadn’t yet realised this – they were grown one besides the other as single entities forming a wide area of small dot-like rounded bushes. The space in between allowed producers to move around the tree and effectively pick the leaves during harvest. The lanes of bushes we see nowadays are in fact a cluster of similarly placed bushes, but for the ease of machine harvesting have been allowed to grown into one another. Continued trimming has resulted in the smooth surface we know today. This is just one example of how our perception of a traditional tea has become changed.